EXCLUSIVE: First Look At Ford's 6.2-Liter V8 Engine...In A Houston Garage?! 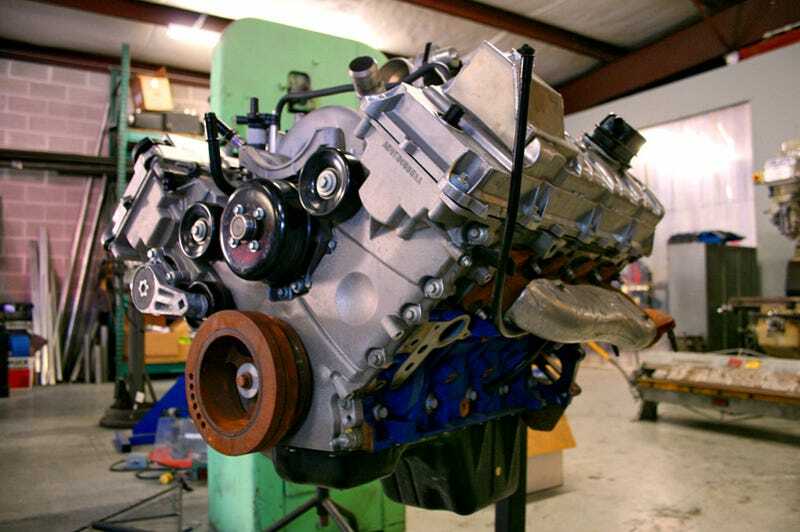 The 6.2-liter Ford V8's the next big n' bossy engine out of Dearborn. Yesterday we took an exclusive first look at an early prototype and got the story of how it's been stashed in a Houston garage for five months. We've known for a while the Boss was coming, and that the Raptor XT would get the first implementation of the giant engine. But other than data and a few photos from Ford, the 6.2-liter version of the motor has stayed in Ford's possession. Well, that's what we thought. It turns out Houston-based tuning shop Fastlane has had six of what they believe to be prototype versions secretly sitting inside their nondescript and hard-to-find shop in a commercial strip around the corner from a Chinese buffet for almost five months. The details of how they got there are purposefully vague, but shop owner/founder Nick Field has been sitting on this big engine for far too long to not want to share. When Ford needs to dispose of their experimental parts some of it gets crushed and some of it gets sent out to salvage. When it goes out the door someone gets tipped off. It's that unnamed middle man who originally bought these engines (and tons of other bits and pieces) and put them up for purchase as part of a massive Ford garage sale. When Field saw the list of what was for sale, he was able to guess it was important and bought all six of them for a price so low you wouldn't believe if we printed it. That's right. Six of them. The one we photographed is sitting in the middle of Fastlane's office on an engine stand, as if it were just another of the many other motors floating around the shop. You wouldn't even know it was a Ford as the engineers were at least smart enough to grind off most of the identifying numbers and all but one small logo, though they left a few of the sensors intact. Although Ford may not be marketing this engine as a revival of the Boss engine, trust us when we tell you, it's the Boss engine. This is most likely an early version as it features a cast-aluminum intake manifold the designers used to make volume adjustments before they switched to the plastic version found on later prototypes and now the final production iteration. None of Fastlane's motors are running yet, but to Field and the Fastlane crew there's a belief this is an engine with promise for the tuner set. And they should know, as they're the company behind the fastest CTS-V and the fastest 2010 Camaro in the world. The stats from Ford on the engine are as follows: 9.8:1 compression ratio, two plugs per cylinder, cast iron block with aluminum heads, cross-drilled mains, and 411 HP/434 lb-ft of torque in XT trim with a 500 HP version apparently coming. An engine dyno is going to be scheduled as soon as Fastlane gets the Boss actually running (Ford of course didn't ship it out with the ECU). But what are they really going to do with six big experimental engines? In addition to getting quite the head start in terms of aftermarket development, one is being kept on display, two of them are planned for the company's racing Mustang, one belongs to customer/shop mascot Mark Ponter, one is being prepped for a restomod '67 Mustang, and the other one has an undecided fate. Whether this new "Boss" motor is destined only for trucks or if it becomes Ford's answer to the HEMI and Vortec engine in passenger cars is still unclear. All Nick Field knows is "We're getting one in a Mustang."